With Facebook presenting a tempting target of 800 million potential customers, small businesses are flocking to social network as a fast and easy way to generate business. But many SMB’s don’t take full advantage of the Facebook platform because they’re intimidated by the learning curve and the technical knowledge that Facebook applications demand. Against the GrainThis is one in a series of posts that explore people and technologies that are enabling small companies to innovate. The series is underwritten by IBM Midsize Business, but the content is entirely my own. That doesn’t have to be the case, says David Brody, Managing Partner at North Social, a software as a service company that specializes in serving small and medium businesses (SMBs) with a suite of Facebook apps that they can quickly integrate into their Facebook presence. I talked to Brody about tips for SMBs that want to optimize their Facebook presence. It’s not about the likes. Research has shown that few people who “like” a Facebook page ever return to it. That means that getting a like is a means to an end, but not a goal. “This is a test-measure-modify world,” Brody says. In other words, experiment with different offers and incentives to build fans and then measure those that deliver engagement and return visits. Remember, this isn’t direct mail, and your cost of trying something new is basically zero. On the flipside, simply getting someone to click a button is not enough. “‘Excite, Educate, Motivate’ has replaced ‘Awareness, Trial, Purchase,'” Brody says. Match the offer to the business. Those ubiquitous iPad giveaways may not be doing much more than delivering business to Apple. Brody tells of one business owner in Atlanta whose offer of a flat-screen TV as contest prize yielded only 60 new likes. Maybe the problem was that the company is in the heating/ventilation/air conditioning business. An offer of offer of free or discounted air conditioning equipment might have played pretty well in Atlanta during the summer. Capture and communicate. Facebook pages and apps offer easy ways to collect e-mail addresses. This creates a permission-based vehicle to continue a conversation. E-mail and news feeds can be used to deliver an ongoing stream of information that reminds people of who you are. 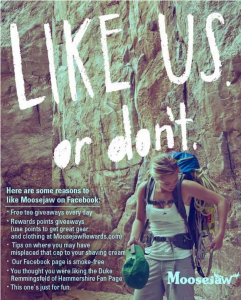 Clif Bar asks first-time visitors to like its page in order to sign up for a newsletter, while Moosejaw Mountaineering touts giveaways, rewards points and tips.. This doesn’t mean e-mail is obsolete, but with inboxes mail clogged and people spending an hour a day on Facebook, the newsfeed has become an attractive alternative channel. Use Facebook for sampling. Conventional wisdom holds that product samples need to be distributed on the street or unsolicited to the mail. It turns out Facebook can be an even better channel. One North Social customer that makes pretzels distributed 10,000 samples in less than 24 hours by sending them to people who liked its page. People who have opted in for a sample are more likely to be buyers than passersby in a supermarket. Audience quality more than compensates for the higher cost of distribution. Be creative with promotions. You don’t have to incur manufacturing or mailing costs to distribute incentives with value. Think of a digital asset you can create that has zero marginal expense. Dentoola consulting gives away reports on how to apply social media in the dentistry profession. 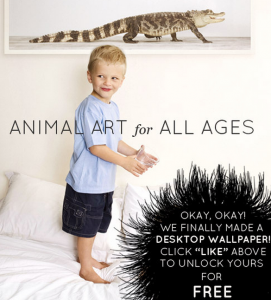 The Animal Print Shop gives away desktop wallpaper. You can exchange a like for a customized press release at Hunter PR. Having healthy teeth and a great-looking smile takes some effort, but the results are well worth it. And having a dentist on your side every step of the way is an important part of that journey. Visit San Diego cosmetic dentist for more information. Buy ads against pages of competitors or similar products. The great appeal of Facebook ads is their narrow targeting. Davids can ride on the backs of Goliaths by targeting ads to fans of much bigger brands. “If your product is candy, buy ads on the Skittles page,” Brody says. It’s the fastest way to find candy lovers online. Keep the message simple and change it often. Don’t flatter yourself by thinking people will spend a minute on your page trying to figure out your message or offer. “Facebook is the equivalent of an out-of-home billboard,” Brody says. “You only have a few seconds to make an impression. Keep your message to a few words and make it compelling.” Remember the earlier point: You can always change the offer and test something new. Get people involved. Brody is no fan of the automated tools that enable page owners to auto-post content across multiple social platforms. “No one wants to be friends with a robot,” he says. “Motivate your alpha evangelists.” Games, quizzes and giveaways work well, particularly if they challenge the audience to be creative. One midsize business that Brody thinks does a lot of things well on Facebook is footwear maker Sanuk. From its provocative “like” message to its offbeat video to an online store that juxtaposes user comments with product shots, it provokes conversation at every turn. North Social’s examples page has plenty more. This entry was posted in advertising, Facebook, marketing, Social Media, social networks, Tips and tagged Animal Print Shop, Clif Bar, Dentoola, Hunter PR, Moosejaw Mountaineering, North Social, Sanuk by Paul. Bookmark the permalink.